Yesterday, we visited Yad Vashem, the Israel Museum, and finally, Machane Yehuda. My father had already visited Yad Vashem during his previous trip to Israel, while it was my first time seeing it. I have a lot to write about it, but I am doing so mostly in my Israel journal, not on my blog. It probably seems strange that I am dedicating only a couple of short paragraphs to something so important, while I can make an entire post just about the antics of Israelis, but the reason is that this is more personal. One of the things that struck me in Yad Vashem was the connection between all Jews. There were all types of different Jews there -- Chareidi, daati, wearing kippot srugot, not religious at all, Israelis, Americans, Russians, Spanish, French. And yet you looked at all them and knew they were part of your nation. You felt able to relate to them, even though they were complete strangers. After viewing photographs or certain parts of the museum, you would catch someone's eye and acknowledge them as someone who is feeling the same way you are because you are all part of the same thing. It was unbelievable. After Yad Vashem, we took a taxi to the Israel Museum, and we did not let ourselves be cheated. One driver offered us a ride for 40 shekel. No deal. He also offered to drive us to Ashdod, which was completely out of the blue. In the Israel Museum, we saw four main exhibits. The actual museum is being renovated, but there were some exhibits open, such as Masks, Family Traces, a model of Jerusalem from the time of the Second Temple, and the Dead Sea Scrolls. I remember the scrolls were on display in NYC for some time last year and I wanted to see them, but I never ended up going. The last part of our day involved Machane Yehuda. Now that was fun! I could have spent hours just walking around and exploring. It is the perfect place for observing people, and I believe that if I stood there for a couple of hours, I would be able to write fifteen pages about it at least. You have Israelis yelling from all sides and inviting you to check out their shops. There are Israelis shoving halva in your face, insisting that you try it. (I shoved my camcorder in his face instead.) 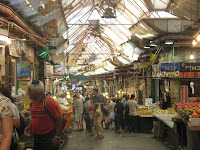 Then there are other Israelis enthusiastically waving at you when they see that you are filming the shuk. There is something about a camcorder or a camera that makes them feel encouraged to make their presence known. At one point, I walked into a little shop full of odds and ends like broken watches, antique goblets and souvenirs, and other items -- just a bunch of stuff, much of it simply piled one on top of the other. That kind of stuff always seems to fascinate me, so I walked in. The owner greeted me, and I replied, "Shalom," in return. I think he must have asked me something in Hebrew and I looked at him blankly because I had not understood it, so he asked me which language I speak. "Anglit v'rusi," I replied. He smiled and began talking to me in Russian, asking me where I am from, what I am doing here, and so on. I told him that I am from New York and am on vacation here in Israel. The next thing I knew, he was telling me that he has a son whom I can marry and settle down with in Israel permanently. I think I was too speechless to do much else but stare at him. He added in Russian, "He's younger than me!" I was still unable to actually say anything coherent. My thoughts were something along the lines of, "You have got to be kidding.... This is crazy!" My father came looking for me, so I introduced him to the storeowner, who repeated his offer of his son's hand in marriage. My father seemed eager to get out of there, so I thanked the man for the offer, said goodbye, and went on to explore more of the craziness that is Machane Yehuda. 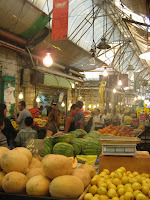 This entry was posted on Wednesday, August 12, 2009 at Wednesday, August 12, 2009 and is filed under Israel, marriage, photos, Places to Visit and Things to See, shidduchim . You can follow any responses to this entry through the comments feed . Haha funny story, probably not so funny for you at the time though. I guess the guy saw something in you.... also wondering what your real future husband would say about that. The first time I went to Israel, an Arab kid in the old city offered to buy me from my parents. That was creepy. Oh can you do me a huge favor? Can you look up Mark Tochilkin there, call him up, make friends and buy me one of his paintings or at the very least a giclee? You will make me sooo happy! I want one of his paintings of an old man with a white beard. I will owe you sooo big if you can procure me one. Anonymous -- What would my real future husband say about that? I don't know -- maybe that he's lucky I did not accept this offer? Haha. Sophie -- Yeah, I've encountered my fair share of creepiness here in Israel, although it mostly came in the form of Israelis, not Arabs. (And my fair share of 'shidduch proposals'.) But this man wasn't offering me to date or meet his son -- he was offering that I should just go ahead and marry him. He skipped the shidduch step. And oh sure, I'll just call up an artist and say, "Hey, what's up, ma nishma, want to be friends?" We'll see what I can do though. He's a Russian dude, just tell him I love his art and have been drooling over it for years. Hopefully he'll be flattered and sell you some art at a deeply discounted price :-). Creative Alternative used have one of his paintings and I'm still kicking myself for not snatching it up before someone else did, although the price tag was pretty intimidating. Maybe he's got some smaller ones or some prints? I am trying to figure out if you are serious or not... You know, there are art galleries in Israel selling his stuff, making it unnecessary to stalk the actual artist. It's expensive in galleries. Plus he might have something small that the galleries are not interested in carrying, but I would want. Why the heck am I communicating with you through your blog? Do you have any contact information or anything? Because it's nearly impossible to just find him here, although I know of a gallery that sells his works. We're going to Ashdod in about an hour, so whatever we're doing we'll do from there. We'll take a day trip to Tel Aviv tomorrow. So let me know if you have any other info.